Justice Margaret Oguli of the High Court Civil Division has set February 15, as the date she will deliver her verdict in the case in which former Forum for Democratic Change (FDC) leader Kizza Besigye is accusing UBC for discriminating him in the run-up to the 2011 presidential elections. Dr Besigye names Uganda Broadcasting Corporation and its then Managing Director Edward Musinguzi Mugasa as having discriminated against him by not carrying his campaign messages yet UBC had been paid for the airtime. Mr Musinguzi was sued for allegedly being responsible for the actions of the broadcaster. Through his lawyers, A.F Mpanga Advocates, Besigye says this violated his rights under the Constitution, the Presidential Elections Act 2005 and the Broadcasting Corporation Act 2005. Dr Besigye, who led the biggest opposition group against President Museveni and his party, says he was discriminated against on the basis of his political opinion. He said campaign messages of other presidential candidates were broadcast while his were left out. Besigye is seeking recovery of more than Shs21 million for at least 200 airtime spots, which he said was paid to UBC through his agent, Big Ideas. He is also seeking interest of 30 per cent on the payment to be calculated from December 2010 until full payment is made. Dr Besigye further wants court to grant him general and exemplary damages at 15 per cent from December 2010 till payment in full. Dr Besigye also wants court to issue orders to UBC not to violate people’s rights again by not granting them equal access to State-owned media during forthcoming presidential elections. 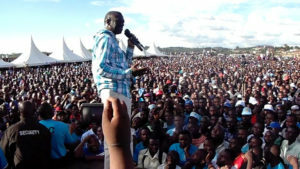 His action against UBC arises from 2011presidential campaigns when he was the flag bearer for both FDC and the Inter-Party Corporation.